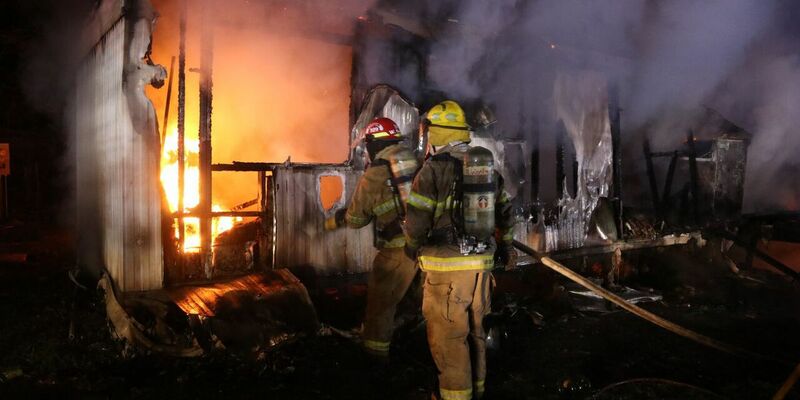 HARRISON COUNTY, MS (WLOX) - A couple escaped a burning mobile home by climbing out a window after their dog woke them up around 5:30 a.m. Saturday morning. Upon arrival, firefighters found a man and a woman, who both had to break a window and climb out to escape to safety. They both suffered smoke inhalation, and the male received some burns and cuts on his arm after breaking the window. Both were transported to the hospital by American Medical Response. According to Fire Marshal Pat Sullivan, they barely escaped the burning trailer. “Another three to five minutes, and we don’t believe they would have been able to escape. This is why we always recommend you have smoke alarms with fresh batteries in your home," Sullivan explained. “In this case, we believe the couple’s dog saved their lives. But you can not depend on a pet to save you. The early warning that smoke alarms provide gives you time to get out safely and alerts you sooner, which helps reduces the damages." The fire is believed to have started by candles in the trailer. The trailer is on Tuxachanie Creek. Units from Harrison County Fire Service, Biloxi Fire Department and North Woolmarket Department responded to the fire. The dog made it out alive.